Spend a day or two in downtown Minneapolis, walk the skyway, browse the shops along Nicollet Mall, wrangle the typical weekday traffic... and then head out to the Chain of Lakes area, and you'll see why they are such a coveted part of the metro area. I've had the major waters of the Chain of Lakes in the shop for many years, but I've finally added the last of the group as an individual piece, pretty little Cedar Lake, and it's ready for you in the shop right now. Click on the photo below for more information and the listing to make it yours. While I certainly enjoy every lake I get an opportunity to cut, I relish learning about and rendering lakes that are near to my childhood home in north central Minnesota. Cass Lake is just east of Lake Bemidji, and home to the school where I completed my student teaching. Driving up to Bemidji from the metro area, reaching Cass Lake is the last milestone of the journey. The Brainerd Lakes area is one of the handful of areas in Minnesota where people from all over flock during the summer for a relaxing cabin weekend, a fishing adventure, or just to escape the confines of city life. At the heart of this part of the state, sits the lovely Gull Lake. 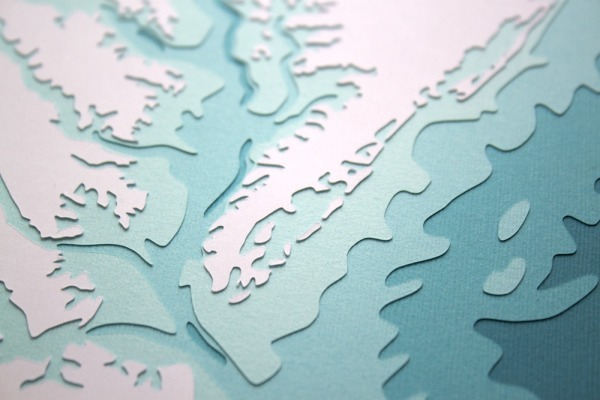 Gorgeous shorelines, multiple bays, and mysterious depths make this not only a memorable body of water, but a stunning subject for a layered paper artwork, too. See more information and get your own by clicking the photo below. Way up in the middle of nearly nowhere in north-central Minnesota, hides a magical place called Burntside Lake. Over 100 wooded islands, clean water, and loon song. People don't like to talk about it much for fear that it will become a major tourist destination and ruin the remote beauty of the area. Secretly, I think most people just want to own the area for themselves. While that's not likely to happen, you can now own a piece of art featuring Burntside Lake -- in 8 x 10" or 12 x 12". Click the photo below to grab your own piece of this gem. Coming from a small town, it was downright scary for me to visit the Minneapolis-Saint Paul area in Minnesota. Later, my life Madison, Wisconsin was an easy primer for bigger cities, but it was still nerve-wracking for me when I first toured my first truly "capital C" City, Chicago. Imagine my delight then, to walk up, down and within Navy Pier on my first visit there, to take in the grandeur of Lake Michigan from the miles of sandy beach shoreline, to explore the heights of the urban sprawl from the Hancock Building, and to ride the "el" and live to tell about it! Still there? Great! Thanks for sticking with me. While there's loads of good reasons to celebrate the start of a new year (waxing daylight, fresh starts, fun crossing out 4s and writing 5s), one of my favorites is having a little more time of my own after the rush of holidays and end of the year hoopla. My brain switches from survival mode after working so hard to get piles of orders out as quickly as possible, to creative mode to come up with ideas to fill the time. Thank you for your enduring patience, everyone! The listing for the Chesapeake Bay is up, and I'll be filling orders within a 1 - 2 business day turn-around. Believe it or not, I've actually completed a design for the Chesapeake Bay, and I will have the listing in the shop soon! It's here! See post above. For now, here's a few glamour shots. Read more about It's coming! As 2013 winds down, I'd like to take a moment to thank you for being part of another great year. Yes, you. Whoever you may be, and in whatever way you've been part of the Crafterall world, please know that I appreciate your business, your support, your friendship, your guidance, and your presence. It's been a great year, and I look forward to forging ahead into 2014.